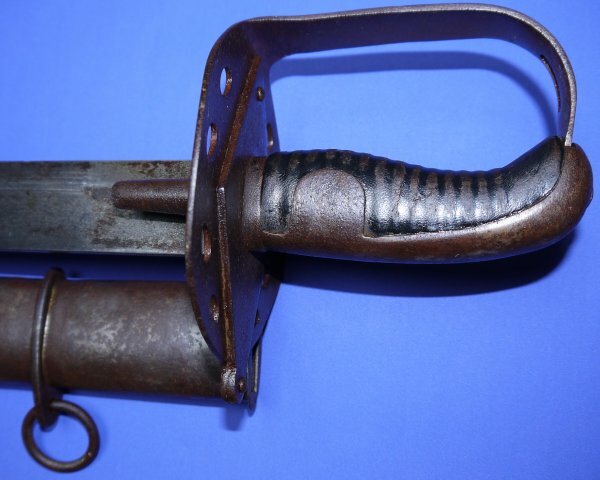 In very good condition with hatchet point (unmodified) blade, a guaranteed authentic Waterloo service 1796P British Heavy Cavalry Trooper's Sword marked to the 1st Kings Dragoon Guards. They really do not come any better than this one; this is a true museum piece both in terms of condition and provenance. 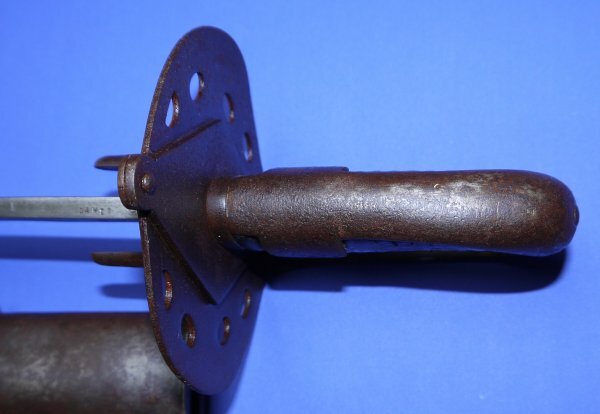 A Dawes made 1796 pattern heavy cavalry trooper's sword marked to trooper 42 of Troop G of the 1st Kings Dragoon Guards ("D 1 G"). This is one of the very few 1796P's that has its original hatchet point still (most were converted to spear point in the field in the last days before Waterloo). This rarest of rare full provenance 1796P's is made even more desirable by the fact it is in such good condition and has neither had its langets removed nor disc guard cut back. What collectors will particularly like about this sword, besides it having its original grip leather, besides it having the same "serial" number to the blade's spine and the scabbard's throat, is the sign of wear / bending to the inner disc as it rubbed against the burly cavalryman. The 1st Kings Dragoon Guards were part of the Household Cavalry Brigade at Waterloo, where they saw very active service, (a detailed account of the 1st Kings Dragoon Guards / Household Brigade's actions at La Haie Sainte Farm and many continued charges with ever depleted numbers continued until there were but 100 of the entire Household Brigade remaining can be read here). This sword was there and would therefore be the pinnacle of any collection and the envy of fellow collectors. The fact it is in such good order may well indicate it was once the sword of an unfortunate fallen KDG trooper, which there were many. 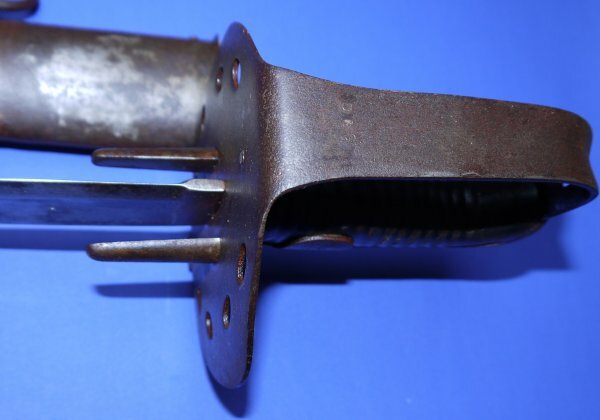 The 35 inch (full, unmodified length) blade is in very good condition, some slight bending to the tip area (not much) which may indicate it hit a target, what may be the remains of a crown view (inspection) mark. Blade is firm in the hilt. 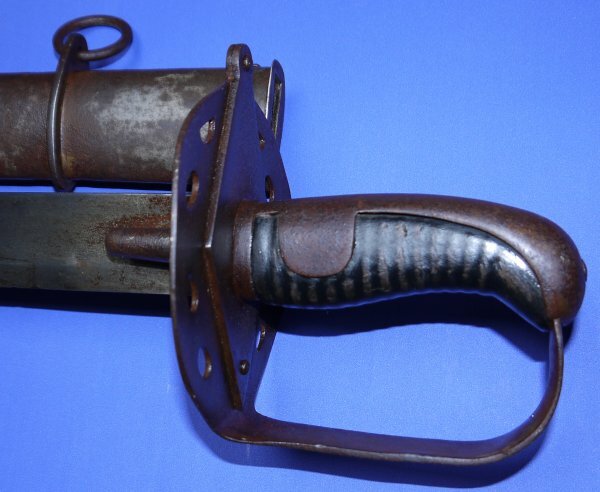 The hilt in very good condition, a little bending (not much) with just a light surface rust. The grip with some wear but good and sound. The scabbard with a little more rust than the sword but still good and sound. The sword sheathes and draws well. What can we or anyone say? This has to be the best of the best. Best we have have ever seen, let alone had. 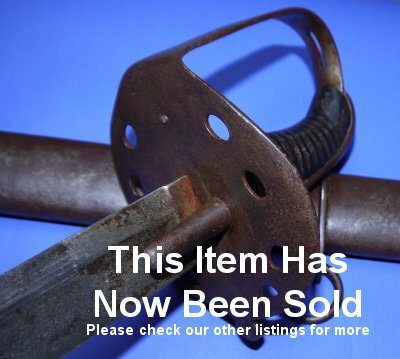 One of the best investments a sword collector or Waterloo historian could make. Yours, reluctantly, for £5500. Please quote item reference number AE54. Further / full sized pictures available upon request. Box 0903-120x19x16 (3.377).